The World Cup final swung on a first-half sequence in which France was granted a penalty kick after a video review and then never looked back in capturing its second title. MOSCOW – Paul Pogba and Kylian Mbappe both scored very fine goals in the second half of the World Cup final, but the moment in which the title was won by France came much earlier, after 33 minutes. Antoine Griezmann swung in a corner from the right and, at the near post, Blaise Matuidi jumped with Ivan Perisic. The ball flicked off the French midfielder, hit the Croatian and bounced out of play. The Argentinian referee, Nestor Pitana, gave a goal kick. A crowd of French players surrounded him, appealing for handball. Pitana got word in his ear and went to look at the video. What he saw was the ball strike Perisic, who was unsighted by Matuidi and almost certainly wouldn’t have had time to react to the deflection anyway. His hand was down by his side, in the most natural position imaginable. And yet somehow Pitana ruled it was deliberate. In Pitana’s defense, it was not too dissimilar to the penalty given to Iran in its game against Portugal. Perhaps referees have been instructed at this tournament that that is to be considered a foul. But realistically, that is nonsense. It means that any player in the box is in perpetual danger of conceding a penalty–unless, perhaps, like the 1930 Uruguayan World Cup winner Hector Castro, they have sawn their hand off in a buzz-saw accident in childhood. Football, more generally, has become more liberal on the handball recently. To concede a handball in the Premier League and the Champions League these days, a player really has to reach out to the ball, or be acting almost like a goalkeeper in making himself as big as possible. That seems a sensible progression: players should not be penalized, penalties awarded and games decided, for matters over which they have no control. This World Cup has returned to an earlier, less reasonable interpretation. Refereeing, in general, has taken on a different form at this tournament. 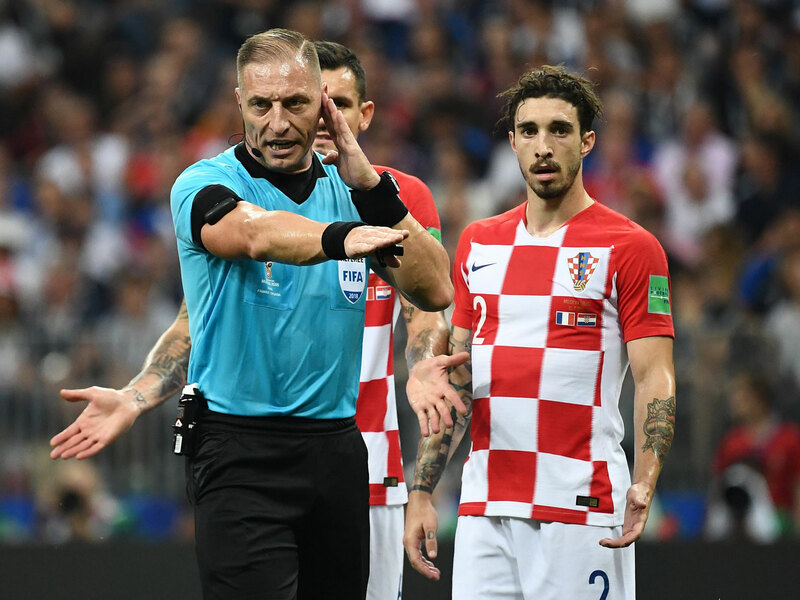 Such has been the reluctance to show cards that only four players were sent off in the entire tournament, fewer than at any World Cup since Argentina 1978–and fewer than on June 18, 1998 in two matches at France's World Cup. Only one player, Son Heung-min, was booked for diving. Players standing over a free kick to prevent it being taken quickly seems not even to be an offense any more. Late fouls and cynical tugs that would have previously yielded bookings have been let go. Some correction, perhaps, was necessary to keep tackling as an important skill in the game, but there has been a sense here that it has gone too far. But VAR, of course, has made the biggest difference. Every corner suddenly became a penalty waiting to happen, whether for a tug on a shirt that previously would have gone unnoticed or for an inadvertent handball. 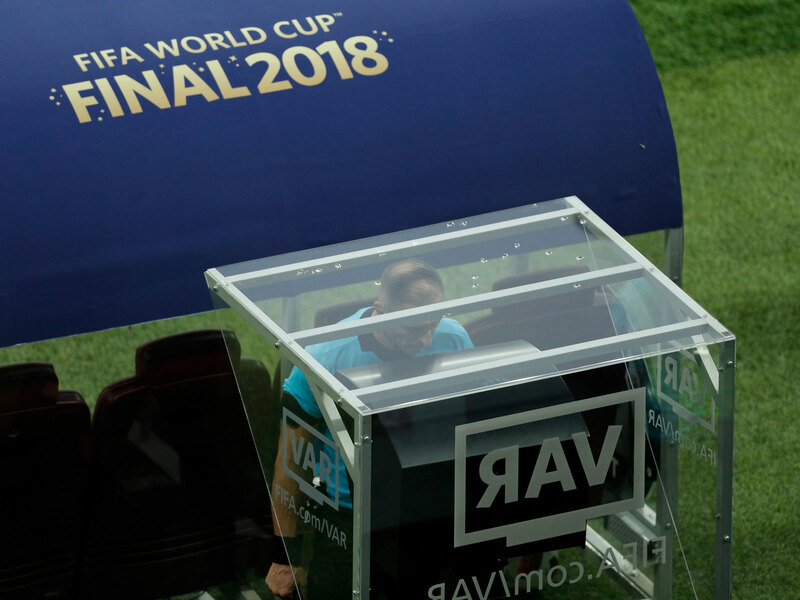 VAR, in this instance, may not be the referee’s friend: slow motion can make something that in real time looks entirely innocent seem like an offense. The system has, broadly speaking, been regarded as a success over the tournament. Goals from corners are up, in part because defenders are now afraid to grapple. But there are still issues in how VAR is applied. Croatia will ask, quite reasonably, why Pitana did not consult VAR over France’s first goal in which Paul Pogba, who was interfering with play to the extent that he was actually touching Mario Mandzukic as he flicked Antoine Griezmann’s free kick into his own net, was offside as the ball was delivered. And then there are issues in how individual referees interpret decisions. Whether Pitana was acting in accordance with refereeing guidelines for this tournament or not, Perisic’s handball cannot be an offense. When margins are so fine, in a sport in which goal-scoring is so difficult, to give penalties for accidents renders it a farce. Croatia was an underdog anyway, all the more so because it has played 90 minutes more than France at this World Cup and had a day’s less rest before the final. It had overcome considerable odds before; to ask it to do so again while questionable refereeing gave France two goals was a step too far. As Croatia chased the game, gaps inevitably opened up and there is not team as ruthless as France on the counterattack. VAR had a good tournament, but it handed France the final.